I love Etsy and I found another company to tell you about this company is called Bubbles and Company this company sells items such as bow holders, hair clips, personalized jewelry boxes, happy birthday party hats, personalized key chains, picture frames, and so much more. 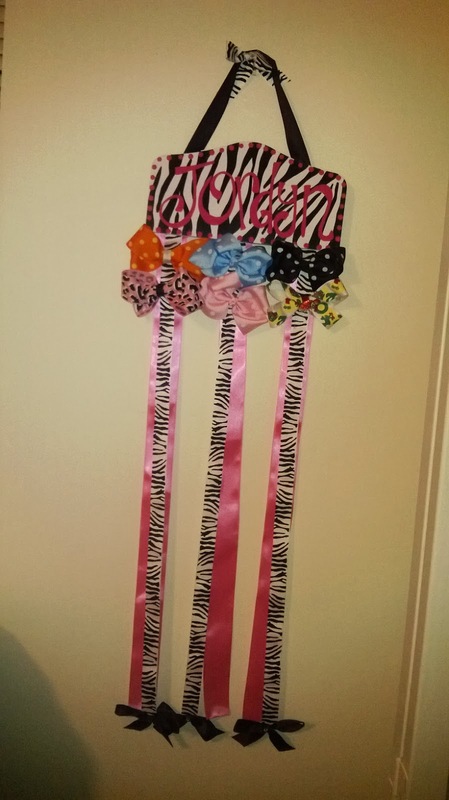 We choose to review their Plaque Style Hair Bow Holder-Zebra Black and White Personalized this plaque is so beautiful I am learning how to make bows so my daughter will have a huge collection so now we have somewhere to put them she loves the pink,black,and white zebra theme. And it was made just for her it is personalized with her name on it too. Thank you for visiting my shop. I have been an artist all my life. I grew up in Fort Worth, and as a child my mom would enroll me in art classes at the local museum. She did this to give herself a break from motherhood. She did not realize the true gift she was giving me. My company's name has a special meaning. It is named after my best friend's dog, Bubbles. This shop is dedicated to Terri (Bubbles's owner), one of the two best friends I have had in my lifetime. Both of my best friends are now gone but their spirit lives on. Terri died from lung cancer and Lisa was waiting for an liver transplant. Please try to refrain from smoking which was key in Terri's cancer and please be an organ donor to help people like my friend Lisa. Please do not copy my Library of Congress Copyrighted items. All matters will be turned over to etsy legal immediately. Do you want to win a plaque style bow holder?? One Winner will be able to choose one of their own!!! Enter the Rafflecopter Below for your chance to win!! I love all the little owl bow holders and the Cotton Candy! Pink/Pop Pink/Turquoise plaque! Oh, and sooo many other things!! You do amazing work its really hard to choose a favorite anything for a 5 year old my granddaughter is my pride and joy. 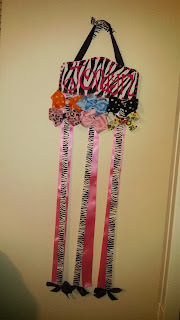 I like the pink and brown glitter zebra bow holder, it is so cute! I like the headband party hats, they are so cute and so many great styles to choose from. My daughter would love one.